During the early stages of osteoarthritis, the cartilage, which is the rubbery tissue that keeps bones from rubbing against each other, suffers from a reduced ability to resist impact. 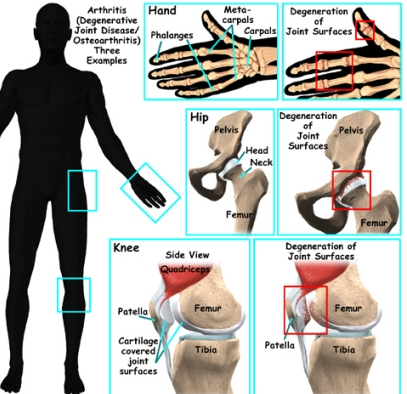 Researchers found that such cartilage damage was an early sign of osteoarthritis, and in this early stage of the disease, there was a reduced ability of the tissue or cartilage to resist high-load activities, like jumping or running. Approximately 1/3rd of older adults in the United States are believed to suffer from osteoarthritis. Broadly, to qualify for Social Security disability benefits, it is important to show that your condition makes it impossible for you to perform routine activities like walking, standing, pushing, pulling, carrying, handling, and bending. For example, people who suffer from osteoarthritis are typically limited in the way that they can use their arms and hands, and have problems with standing and walking. These impairments could make you eligible for benefits.